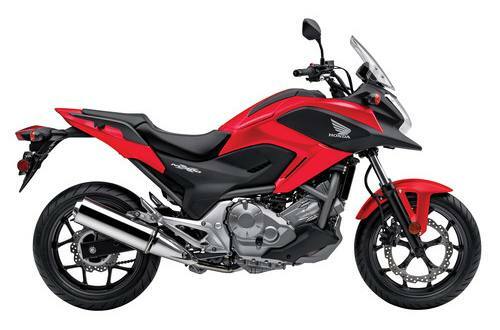 Named one of Cycle World’s “10 Best Bikes for 2012” in its first year, the NC700X is an awesome commuter during the week. On the weekend it lets you go exploring in the country, or carve up a twisty canyon road. This version features Honda’s exclusive Dual Clutch Transmission (DCT), and comes with Honda’s revolutionary Combined ABS! Powerhouse Twin: The NC700X’s 670cc liquid-cooled parallel-twin engine produces tons of torque and enough power for easy two-up cruising. But it's thrifty, too — the standard transmission version gets an estimated 64 MPG. Bike of the Year: This interesting, original, approachable and affordable machine takes us back to a time when those qualities helped Honda take the world by storm. What’s not to like about scooter-style storage and great gas mileage in an adventurous-looking package that goes and handles, if not like a sportbike, at least like a sporty bike? Take It With You: In the real world, we need to carry more than just a cell phone and a credit card. That’s why the NC700X offers a 21-liter utility compartment, big enough to hold most full-face helmets. Safe, secure, and convenient, you’ll use it every time you ride. Your Bike, Your Style: A wide array of accessories designed specifically for the NC700X is available to help you personalize your adventure and get what you want out of your new ride. Best of all, they feature the same quality and durability you’ve come to expect from Honda. 670cc Parallel-Twin Engine: With its cylinders tipped 62 degrees forward for better weight distribution, the NC700X's engine is a big step forward in modern powerplant design. The two-cylinder format produces tons of low- and mid-range torque, and the 270-degree-phase crank and uniaxial primary balancer make it smooth, too. Electronic Fuel Injection: Carbureted engines can be fussy when it comes to feeding them fuel. Not the NC700X. Electronic Fuel Injection means easy startups on cold mornings and flawless running even at high elevations. Cast Aluminum 17-inch Wheels: The 17-inch wheels give you a wide choice of premium tires to choose from, and really help the NC700X offer responsive handling in turns. The cast wheels are light and strong too. Diamond-Shape Steel Frame: Light, strong and with just the right amount of stiffness, the NC700X's rigid and compact chassis is the foundation for precise handling. 41mm Fork: With six inches of travel, the NC700X strikes a perfect balance between a long-distance and a short-hop street machine. This gives it a wide range of capability, good handling, and helps inspire confidence. Underseat 3.7 Gallon Fuel Tank: Underseat 3.7-gallon fuel tank centralizes mass and enhances overall handling. Locating the fuel filler underneath the passenger seat allows for innovative centralized storage. Large Integrated Storage Compartment: The NC700X offers a 21-liter utility compartment, big enough to hold most full-face helmets. Safe, secure, and convenient, you'll use it every time you ride. Low-Profile Windscreen: The NC700X offers just the right amount of bodywork, enough to offer good wind protection but not so much that the bike gets heavy or wide. LCD Instrument Panel: Full digital LCD instrumentation includes digital speedometer, digital bar-type tachometer, clock, low-fuel gauge, and two tripmeters. The meter is light, compact, and easy to read, too. Optional Automatic Dual-Clutch Transmission (DCT): Shift with the push of a handlebar-mounted button, or select the NC700X's automatic mode and the bike will shift itself. DCT has been a huge hit on our other models, and once you ride an NC700X with DCT, you'll see why. Disc Brakes with Available Combined ABS: Single front- and rear disc brakes give the NC700X great stopping power. The brakes are linked rear-to-front and incorporate an Anti-lock feature (C-ABS) for excellent stopping power, especially under challenging conditions.